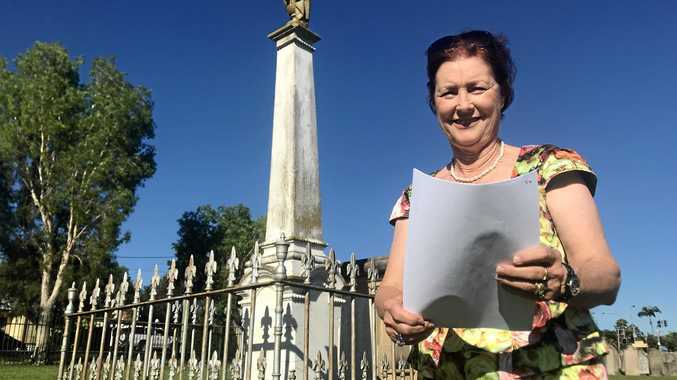 STATE secrets belonging to one of Queensland's first politicians could soon be uncovered as digging starts at Ipswich General Cemetery. Ipswich City Council, in partnership with the University of Southern Queensland, has started the archaeological dig on the crypt of Joseph Fleming, a member of Queensland's first parliament. It is the resting place of Mr Fleming and his wife Phoebe. Mr Fleming represented West Moreton from July 1860 until November 1862 and again from September 1866 until July 1867. USQ Professor Bryce Barker and council staff have supervised the dig, which began this week with a small excavator and will then progress to archaeology students who will use small tools to scrape away dirt. Ground-penetrating radar pinpointed the site and digging started after preparation work. "We will gently take off the topsoil and come down on the core features, on the collapsed part of the top of the crypt,” Professor Barker said. The crypt will be excavated, human remains removed, the crypt rebuilt and then backfilled with the Flemings' remains. A documentary will be filmed and a virtual reality tour of the crypt produced.